April 18-22, 2019 - Sold Out! Sign up for our newsletter below to be notified of upcoming Isla Mujeres Retreat dates and other locations! Hosted by Yoga with Singer, you will spend 5 days and 4 nights for a long weekend on this magical island. April is considered the best weather on Isla Mujeres with little to no rain and an average high of 84 degrees. Roundtrip flights from Austin are currently available for around $400, cheaper from Houston or Dallas. 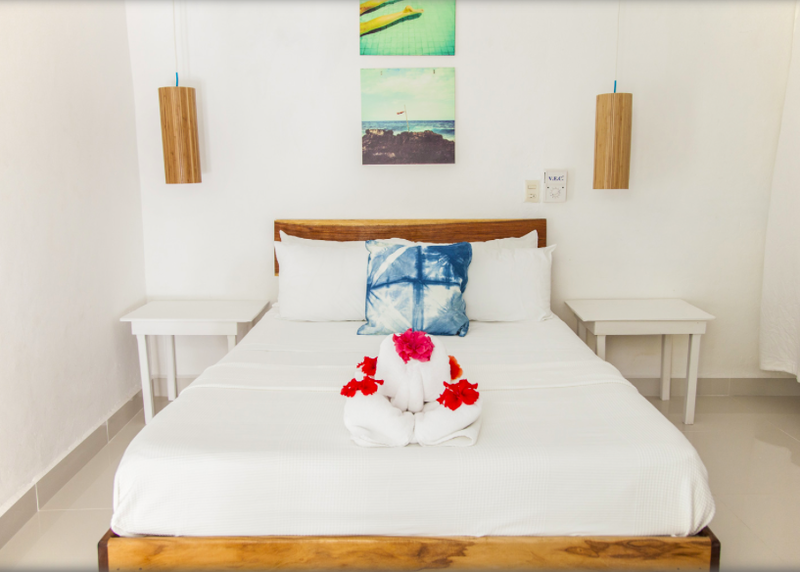 Welcome to our adorable five room hotel; tucked into a lush courtyard and perched on the sea in the beautiful, vibrant downtown Isla Mujeres, Mexico. This retreat is for those who like to have adventures and to come home to a clean, calm room at the end of a day. Mere steps from the best bars, restaurants and nightlife the island as to offer. Climb the stairs of our hotel and catch a glimpse of the sparkling sea. 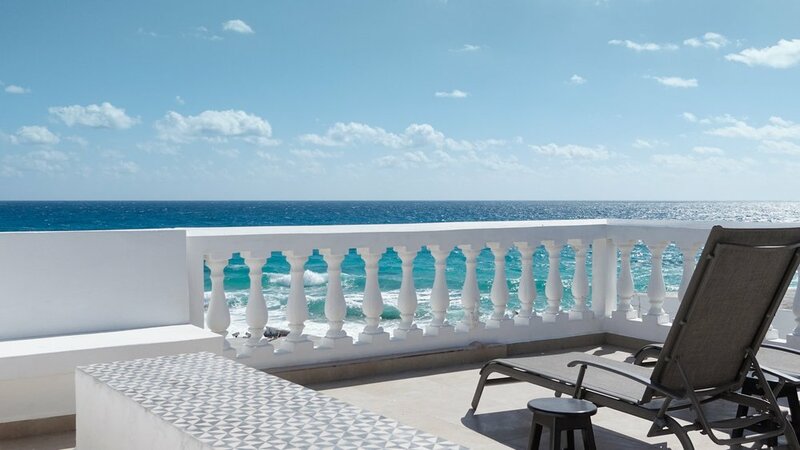 Keep climbing to our rooftop deck with a favorite beverage in hand and take in the sunrise over the Caribbean or watch it set over Cancún. 4 morning + 2 evening yoga sessions (6 total) with Singer will take place here. Make sure to bring your own yoga mat for these all-levels friendly, strengthening and restorative flow classes. Optional sunrise meditation before class each morning. 50 pesos ($3.50) for your luggage handler. We will collect your flight arrival and departure times at least 30-60 days before the retreat. Tips/Gratuity for staff at our Hotel: Housekeepers 20-40 pesos per day ($1.50-$3). "Our hotel's awesome staff cleans the guest quarters everyday except Sunday when they take a day of rest. They are like ninjas and wait until you leave for the beach to clean so no worries about 7am knocks on the door. Chances are you won't even see them but you'll know they were there when you return to a sweet-smelling, tidy room with cute bath towel animal shapes on the bed." Monthly Installments to pay off the remaining balance will start 30 days after your $250 is paid. Final Balance Policy: Your Final Payment must be received by February 1st, 2019, and all payments are non-refundable after this date. Cancellation Policy: In the event of cancellation, 75% of your entire payment will be refunded less the $250 non-refundable deposit and a $50 processing fee if the cancellation is made before February 1st, 2019. Payments are non-refundable after this date. Check in to our retreat hotel is at 4pm - this is when our Retreat officially begins. Check out is by 11am on Monday April 22. We will have rides arranged for everyone from the airport to the ferry port, then we will take a ferry across to the island - Isla Mujeres. The whole trip will take a little more than an hour from the airport. Please plan to BRING YOUR OWN YOGA MAT & BEACH TOWEL FOR YOGA SESSIONS. This is a SMOKE FREE retreat. Smoking is not allowed at our retreat hotel property or inside any of the rooms. All participants must be 23 years or older. Participants 18-23 years old will be allowed if accompanied by a parent.